Hocus Pocus is the magic word to deliver the magic spell that wins you the jackpot. Enjoy this highly graphic wizarding 3 reel and match up owls, spell books and frogs to create an ultimately spellbound slots uk online experience. Eyecon burst onto the scene in 1997 with the massive hit game, Gore. Generating millions of downloads, it provided their base to begin building an online casino system and gambling games. Their first ever slot was released in 2003. Titled, Temple of Isis, it remains a firm favourite with online gamers today. Another huge hit, Fluffy Favourites, released in 2006 is their most successful game to date and remains one of the best slot games available and a favourite here at easy slots online casino. Phsst, over here... How far are you prepared to go to win the slots? How about some magic? Interested? Then Lucky Spell from the clever wizards at Eyecon may be just the old school magic you're looking for. We are at the top of a tower in the wizard's lair. Around him, shelves are stocked with potions and spell books. An owl sits atop of the reel panel and a dragon sits down front with a book. Ok, so the graphics aren't quite spellbinding, but Lucky Spell is full of retro charm and conjures up some classic retro play! It plays along to a jaunty soundtrack and the game play produces some great sound effects and fun visuals that come together to create a very engaging slot. Join today and play slot games online. The wizard himself sits atop a book pile, dressed in purple, wand at the ready. This is a three reel spinner with just the one pay line. The reels are decorated with all things magic and the comical, enchanting symbols include a fire-breathing dragon, an owl, an hour glass and a book of spells. These are low payers and a wizard's hat, a gold ring, and a wand are the higher paying symbols. A handy table sits to the right of the reels showing the symbols and their values. You have likely guessed the aim is to land a line of matching symbols across the winning play line. The top payer is the gold ring, line up three of these and you'll win 50.00. Remember, your prize totals reflect the size of your initial stake. The higher the bet, the bigger the win. Looking closer, you will notice that Lucky Spell actually offers a second game mode, alternate play and in an interesting twist, you can bet there will be no winning line. Right of the bet button, you will see the alternate play option. On a nonwinning line, the wizard will wave his wand over the cauldron beneath him and your win will be displayed in the alternate play box. Below the reels is a game panel and you can see your balance, winnings and your current stake. Two red arrow heads offer the option to set your bet size and this begins as low as 0.01. Below this is an animation setting, help and you can choose the quality of the graphics. Lucky Spell casts a huge charm spell. The graphics are detailed, colourful and well done. Game play is smooth and the ambiance from this retro winner is inviting. If you love this kind of throw back Thursday fun and anything magical then Lucky Spell will easily cast its spell on you. For more information, refer to EasySlots.com and start spinning! For a three reel, one pay line slot, Lucky Spell oozes enough retro charm to keep it relevant in today's online slot world. 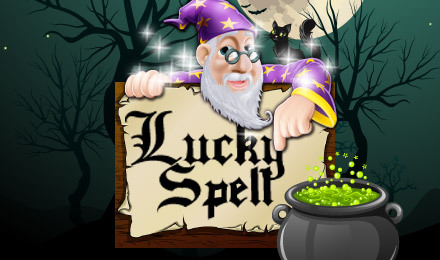 Anyone looking for some retro fun or the magic theme will love Lucky Spell. Its comical appearance and fun graphics create an engaging play and the low betting options are sure to please low rollers and new players. 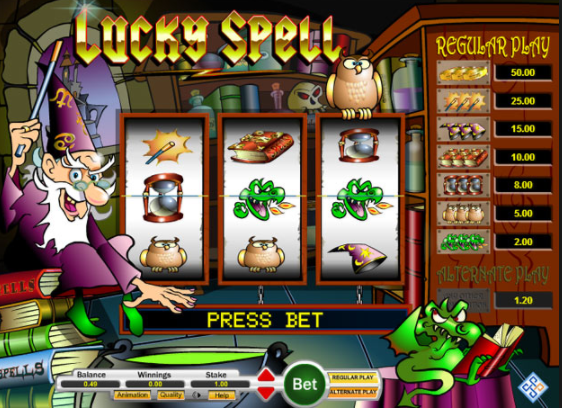 If you enjoyed Lucky Spell then you might also like Mega Moolah Slots.